Cross stitch an underwater world filled with sea creatures of all types with this mini cushion design. A Mermaid and Merman feature, along with motifs of Fish, a Dolphin, Seahorse, Sea Turtle and a pretty pearl in an Oyster shell. The patterns along the edges of the design represent the glimmering scales of the Mermaid in shades of mauve and ocean greens. 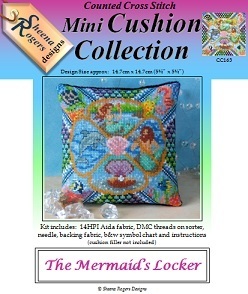 Discover the treasures of the Mermaid's Locker as you stitch.